Got some new tubes in from Reynolds this week that I like. Over the years I’ve developed a feel for what tubing diameters and wall thicknesses work for riders doing what they do. A lot of my frames have a 35mm downtube, 28.6 seattube (for a 27.2 post) and a 31.8 toptube. I like the way frames like this ride. 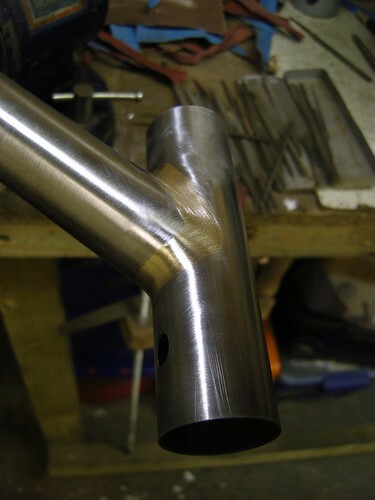 I like the stiffness you get from a big downtube. It’s alway a compromise between stiffness and comfort but this is what I like at the moment. And I’m the boss. 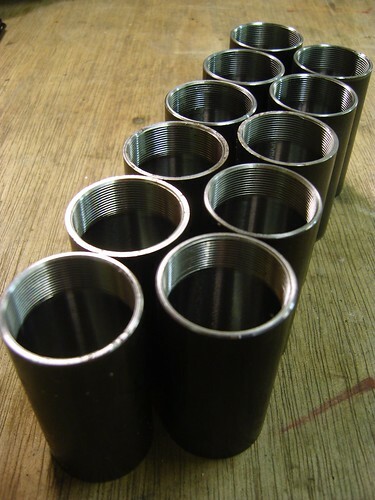 Anyway, the one problem with those tube diameters is that the toptube to seattube join is problematic because you need to join a tube with a bigger diameter (31.8 toptube) to a tube with a smaller diameter (28.6 seattube). 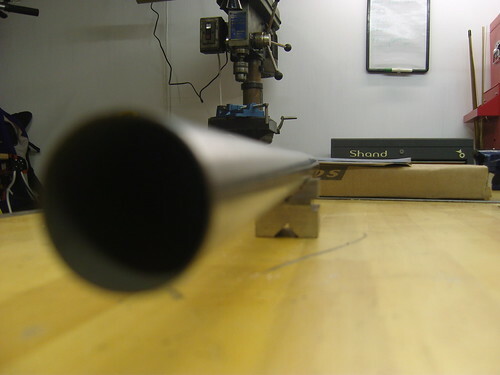 In order to miter the tube to get a good fit you need to ovalise the top tube so that it’s taller than it was, but the sides of the oval are now less than the 28.6 of the seattube. This is a pain in the arse to do and it’s not a task I’m fond of. So, the good news is that I now have some custom drawn Reynolds 853 butted top tubes that are tapered from 31.8 at the headtube (front) end, down to 28.6 at the seattube end. This makes life much easier and building that part of the frame less stressful. 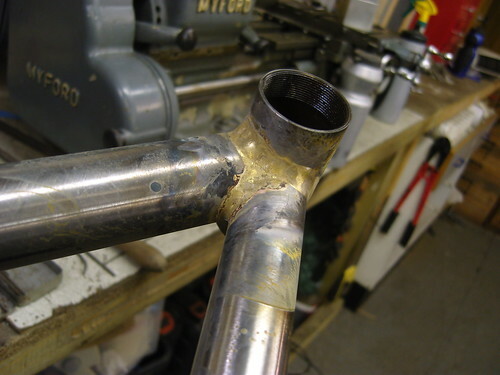 downtube-headtube, a photo by shandcycles on Flickr. BB junction, a photo by shandcycles on Flickr. this was straight out of the soak tank and will take hardly any clean up. bb shells ready to go, a photo by shandcycles on Flickr. This was taken at the Tour of Britain. It was literally seconds before the race started in Peebles and Jens was having some photos taken with some people in the bike shop. My friend Simon was taking a pic of his wee boy Ruairidh beside Jens’ bike when he came out and insisted on getting his photo taken with Ruairidh! The man is a star and a true gent. Unfortunately, later that day we were on the bridge and witnessed the crash that would put Jens out of the Tour after only a couple of hours racing.